A workwear outfit for when it's hot in the City! Today I went to speak to the Lower 6th form students at a local Grammar School. The main focus of the talk was to advise them about interview wear, either for University or more likely, graduate jobs. As part of the presentation two of the girls agreed to model for me and they each had two outfits. Although I covered off one fairly corporate look, I also wanted to introduce some other looks which whilst still work place appropriate, enabled them to express their individuality a little. Using brands at which the girls might typically shop, such as Topshop, Warehouse, Oasis and Mango meant (I hoped) that they would more readily identify with the message that I was trying to convey. With the girls being under 18 I can't show their photographs on here but this outfit was one of the girls' favourites - and mine too. I'll bring you another instalment tomorrow. 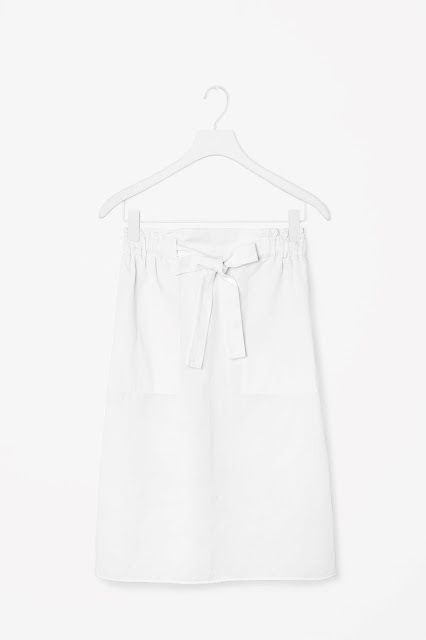 As soon as I saw these Warehouse culottes (£65) I knew that I wanted to use them. They are a lovely draped fabric with a good length and I also liked the clean, simple lines. From experience, younger women don't like the thought of skirts that they consider too long - they just won't wear them as they consider them frumpy, even if they are a pencil skirt - however most culottes tend to be worn either just below the knee or midi length, so they are an acceptable alternative. The v-neck is also great for anyone with a curvy bust and as those of you with one with know, finding v-neck anything can be really hard, especially work wear. 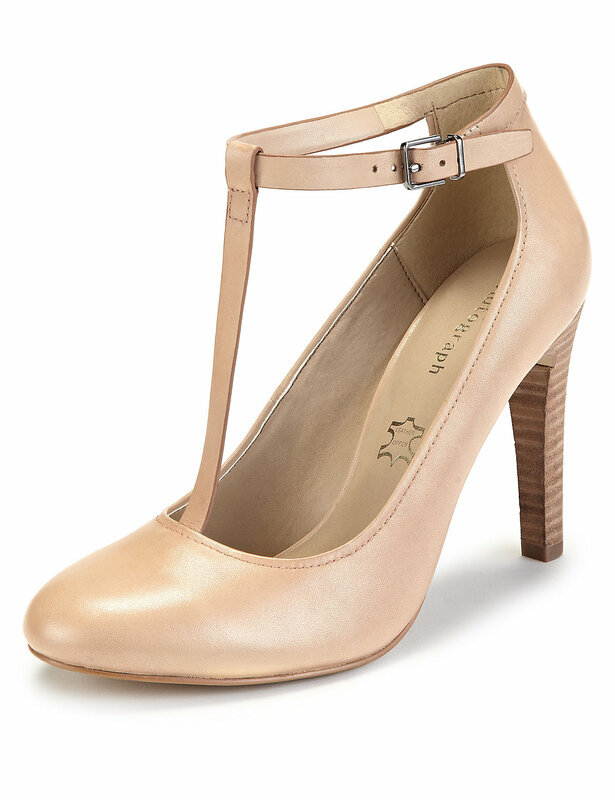 The Warehouse cut out court shoe (£45) is an elegant style. Not too high and in real life they are more of a pale grey than cream - so not as "weddingy" as they look here. And whilst matching the shoes and bag isn't always perceived to be the way to go, I wanted to present a variety of options, so there was plenty of bag and shoe clashing elsewhere in the outfits. Also, if the budget doesn't stretch to expensive accessories, keeping the colour palette simple can work a treat. 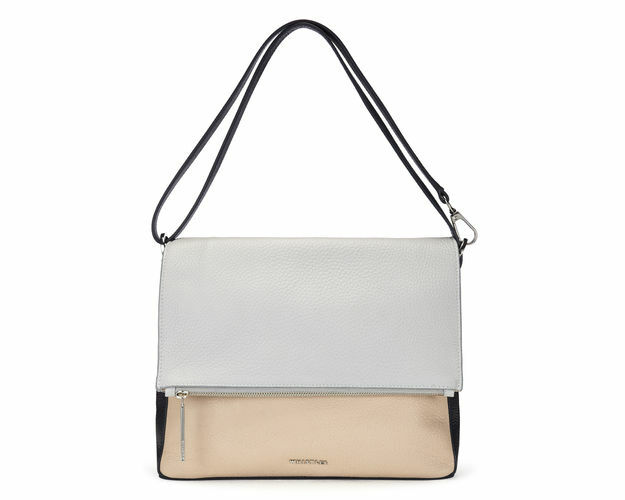 This Warehouse belt detail bag (£15 down from £42) looks much more expensive than its £15 price tag would suggest. I really like the clean lines and belt detail and although some prefer to spend more on a handbag, this is a great option when entering the handbag market - or indeed at all. Finally I used this necklace from Oasis - apologies for the fact that I can't find it on-line. It was £12 and the shape complimented the neckline of the culottes, whilst at the same time keeping the outfit the right side of young and fresh. As for a jacket, for the purposes of today I used a Mango one of mine in various shades of blue. Personally I wouldn't try to match the navy of the culottes to a navy jacket. Instead I would either stick with a black jacket or one in a contrasting colour. Or if the weather and your work place permitted, going jacket less would be my preferred choice. 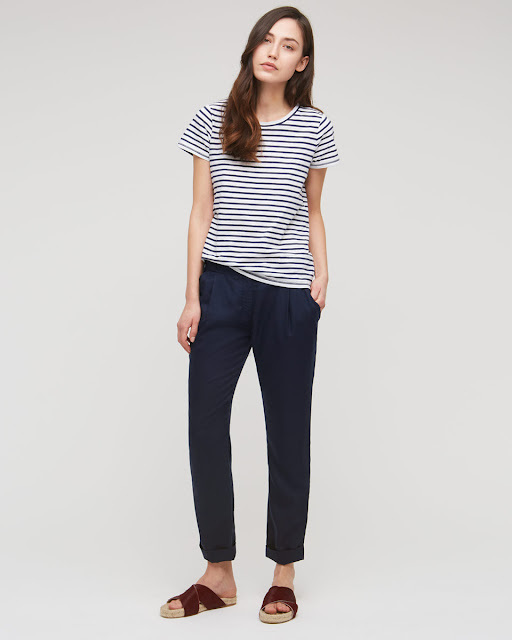 What do you think to the Warehouse culottes? Could you be tempted? I really could as they could be styled for other events too from weddings, to an evening out, with white converse or gladiator flats. Hmmm. Now there's a thought. I bought this pom pom trim dress from & Other Stories (£55) quite a few weeks ago now but saved it for our trip to the US. Having worn it on a baking hot day, and shorts on another, I realised how cooling the dress was compared to the shorts - it must be down to the air circulation! I think that this was the day that we also did the tour of the UN, for which we had to dress appropriately, so the midi length worked well. 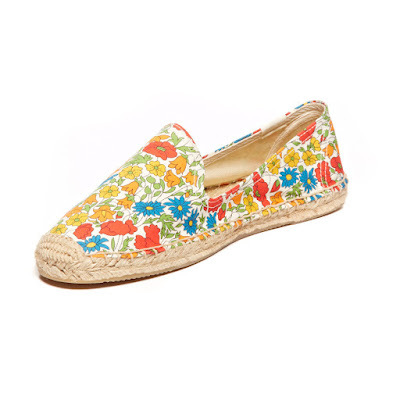 The whole foot bed shoe trend suits me down to the ground and I wore these Aldo shoes a huge amount. From what I've read this trend is here to stay and it's likely to get even more ugly. Apparently really ugly shoes make the rest of one's outfit look even more chic. Or, I wonder, do they just focus the attention on the ugly shoes so that no matter how chic the rest of the outfit, no-one notices because it's totally overwhelmed by the ugliness of the shoes? Now that's one to ponder for a Sunday night! On a down town train"
....and the irony was, I was on a down town train - but it wasn't night time and nor was Rod singing to me. Oh well, you can't have it all. For those of you who follow Style Guile, you may recognise this Claudette dress from Allium B, which was gifted to me a few weeks ago. Its Liberty print is so quintessentially English that I really wanted to take it away with me. An Assistant in J. Crew on 5th Avenue recognised it as being a Liberty print and said how much she loved it - which I thought Mary and Claire at Allium B would be pleased to hear. And for anyone interested, all Allium B dresses are currently on sale, so do nip over for a look. The above photo was taken on the Staten Island ferry, having viewed the Statue of Liberty. My sandals are the Dena sandal from Miss KG (£55), which were amazing comfortable for the eight or so miles that we must have covered that day. And here's a shot of the lady herself! Labels: Allium B, Miss KG. Shorts and pom poms in New York City! Our recent trip to New York was the most amazing experience for the both of us. Our lovely Flossie finished her GCSE's on Thursday afternoon and by 9am on Friday we were heading over the Atlantic. She relished the plane journey where she could sit and, for the first time in months, not do any work. I relished the peace and the fact that I didn't have young children in tow! When it came to packing, I stuck to an almost neutral colour palette of black, navy, white and cream. Any colour came in the form of nails and friendship bracelets. It worked so well that I will be replicating it on our summer holiday next month. Over the next few days I will share a few outfit shots from our trip. Hopefully I won't irritate everyone to death in doing so! This was my first photo on US soil, whilst waiting to go through immigration. I travelled both there and back in my Topshop boiler suit (£65) and it was perfect (despite what people think about "going to the loo" type issues!) I also wore these Aldo Draedia shoes, now £25 in the sale, and my new M&S Collection bag (which still doesn't appear to be online), went everywhere with me. It was the perfect size for our map, my star clutch which had money, credit cards etc in it, suntan lotion, wipes, plasters, sunglasses and a denim shirt in the back pocket - just in case! I would thoroughly recommend it for anyone vaguely tempted. Before I went away, I had my legs sprayed to make them a lesser shade of Persil white. Having said that, I have a feeling that most of it was deposited on the bathroom floor of our hotel when I got changed after arriving. Nice! Unbelievably, given the temperature by the time that we left, it was actually quite chilly on the first day, so this Jigsaw pom pom scarf (£59) came in really handy. I think that I was killing time here in Victoria's Secrets whilst someone was trying bikinis on. Given how many pom poms I was wearing, I gave some thought to the collective noun for pom poms. I wondered whether a "dangle" of pom poms might work? 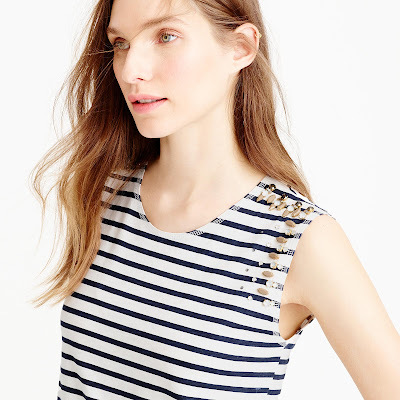 Later in the week, after one or two (OK about five), trips to J.Crew, I bought this striped top (£47 in the UK). More about the pink sandals in my next post! However for now, I'll leave you with a picture of one of my favourite sights - right from the top of the Empire States Building. It's just stunning - and terrifying - up there. "Give me your best holiday face" said the youngest as she was photographing me. And this is what she got! As you can see I'm uber casual today - Topshop skirt, H&M t-shirt, ancient converse and GAP clutch for those million jobs that need doing before you go away. A white bag? Really? Yes really. Before today, I'd never owned a white bag - not even one to dance around in my younger years. I suppose I'd always thought them a bit naff, in the same way that I find white sandals a bit naff but I have no idea why that should be and no doubt next summer I will be at the front of the queue for white sandals. 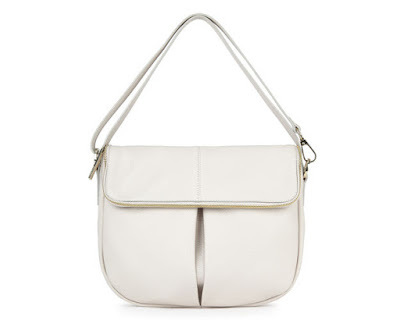 Metallics are my usual preference for a summer bag if I want something that goes with everything but then I was working with M&S last week I spotted this white leather one in Collection. I didn't have time to buy it when I was working and subsequently I couldn't find it on the site (still can't - sorry!) however when I came across it in store today it had 20% off - so obviously it was meant to be. I like the textured look and feel of this bag together with the utilitarian styling, which stops it from being too twee and makes it look a little APC. Also the cross body style makes it more laid back and less fussy than some handbag styles. 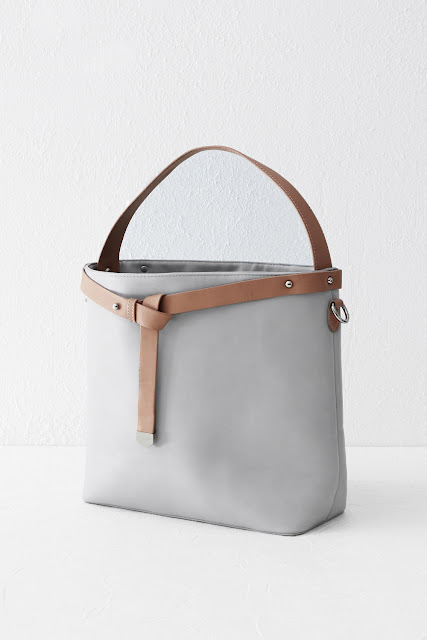 I spotted this raw edge leather bag in Cos (£115) - again the clean, simple lines work for me. It definitely has that Scandi feel about it. 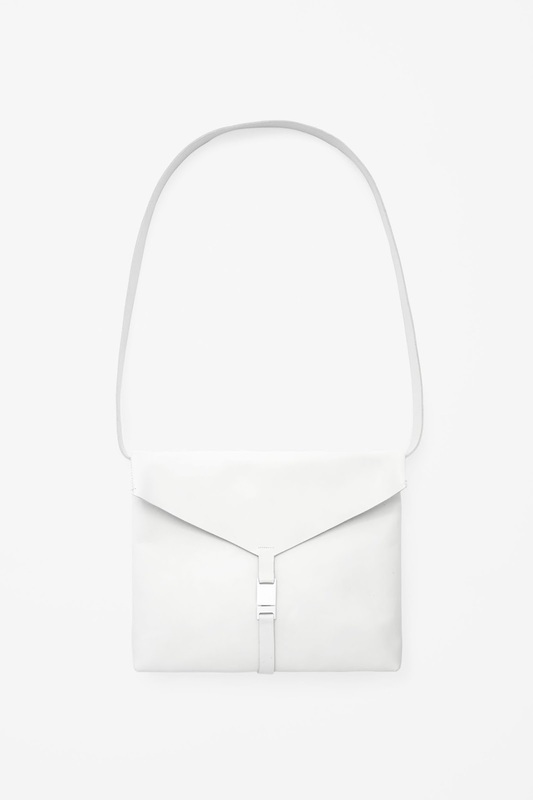 Whistles has this gorgeous satchel (£260) and it can also be worn cross body by lengthening the strap. One of my favourites was the Whistles colour block satchel (£270). OK so it's not strictly all white but the colour palette is so simple and clean for the summer. Having never been a fan of white bags before I feel that I may become a convert. This will (pretty much) be the only handbag that I take away with me to New York when I go this weekend so I will put it through its paces and see how it gets on. From my denim jumpsuit, to shirt dresses, to maxi dresses and my white Cos skirt, it's going to have to work hard. I'm hoping to post one last time before I leave the UK but I'm not sure that I will manage it (although Mr SG has offered to write guest posts for me whilst I'm away) but please do come and find me on instagram for snaps of what's going on. Oh and if anyone has any orders that they want to put in for things from the US, just let me know! Labels: Marks and Spencer. Cos, Whistles. Bomber jackets - have you? could you? will you? won't you? I know that I'm way behind the times on this one. Hec, Mary Berry has been wearing her Zara bomber jacket for a couple of years now but having ventured into Bomber Jacket territory I thought that I would share my thoughts. The one that I'm wearing above is from Jigsaw. I had seen it in store full price last summer but I knew that both the pale blue one and the cream one would be a big mistake, probably lasting approximately five minutes before I wrecked it. Not that I'm hard on my clothes but it really would be the law of sod wouldn't it?! However when reminiscing about them in store last week it came to light that they had a black one in the stock room, reduced from its full price of £169 (I think) to £45. This a lovely option for anyone who doesn't want anything that shouts too loudly. It's soft and silky so could be worn either casually with jeans, or I like them with a pleated, or pencil, skirt. This one is really pretty. 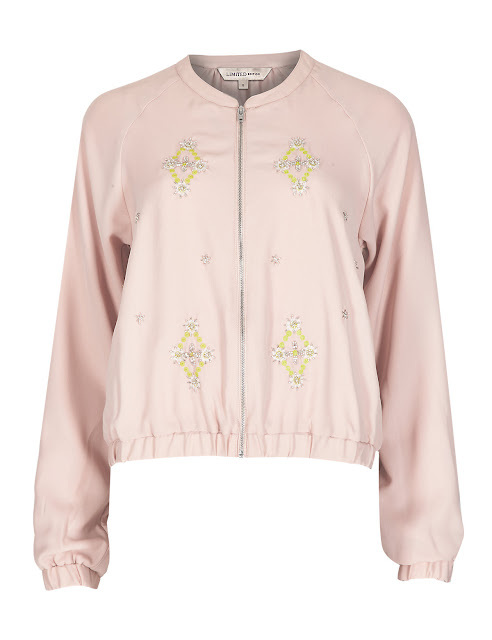 It's a lovely soft shade of pink and the embellishment works really well with it, even in a daytime context. Again it's quite a draped fabric - probably on the slightly smarter side than the one below. 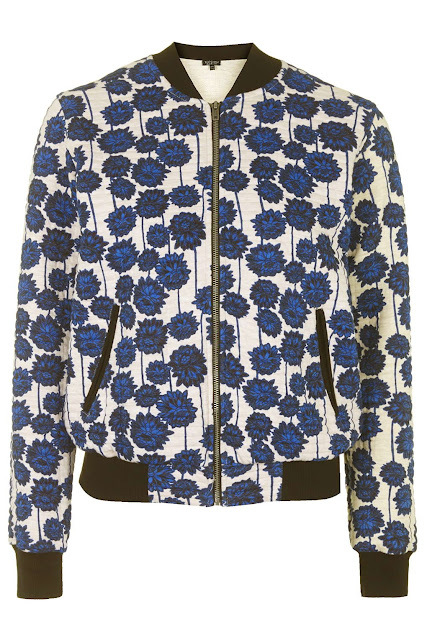 On the other hand, this Topshop bomber (£45) is made of jersey so has a slightly more casual feel about it. 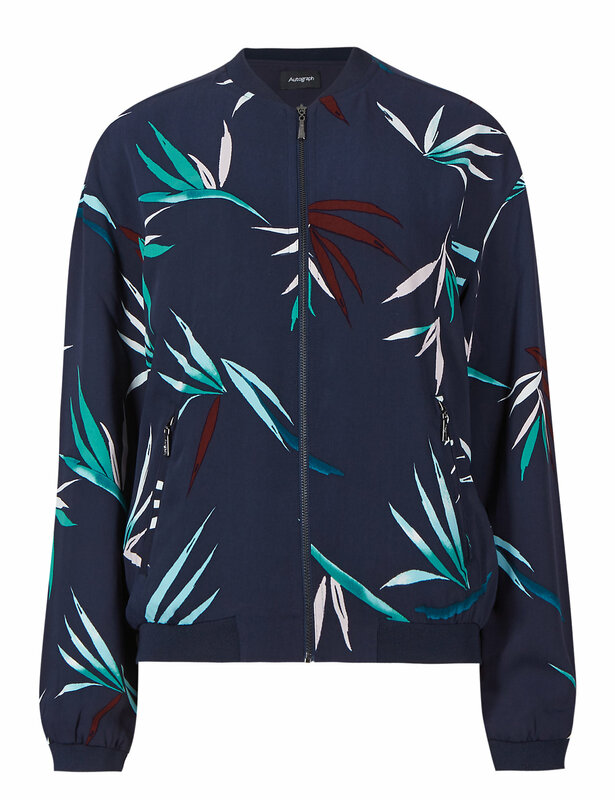 All I would say is that if you're looking for a lightweight jacket to take away on holiday, either to cover your shoulders, or for on the aeroplane or if the nights get chilly, a bomber jacket could be the answer. I will wear mine with shorts, a maxi, a black lace skirt and jeans of many differing shapes. In fact it could do a good job giving lots of things a nudge in the right direction style wise. It's always nice to be invited to do something and a few weeks ago I was asked by M&S to go down to their Camberley store for two days to prep for and present a new style of loyalty event. Ordinarily the style events are run in about 40 stores around the country over a two day period. Presentations are run every hour on the hour and during that time the stylists talk through trends, advise on bodyshape, build outfits, accessorize, talk about underwear and generally show the brand at its best. However this event was somewhat different in that it was run very much more like a fashion show in that there were four models, a catwalk and music. When the stage is finally set but there's no one about it reminds me of a ghost ship - eerily calm. The set was built on the Wednesday night after I had left the store for the evening so it was strange to see it there on Thursday morning. The first day was spent pulling the product, photographing it and getting the outfits approved, tweaking bits and changing sizes, sorting out the running order, labelling the clothes up for the models, marking out the catwalk in a training room for the run through the next day and so on. The second day was spent fitting the models, making the final changes to the outfits, doing a technical run through with the music, de-tagging everything and then getting the models into hair and make-up before the first show at 6pm. I have to say that all the prep was very much a team effort and that I wasn't in charge of the team - I was just a very small part of it! M&S floral lace pencil skirt (£39) - I loved wearing this skirt. It was so comfortable, had a great length and the colour was fabulous. Even given the distance in this photograph you can see how bright it is. For anyone who works in an environment where this type of skirt would work, I would strongly recommend trying it. It would also be good at a formal event, such as a wedding or christening. 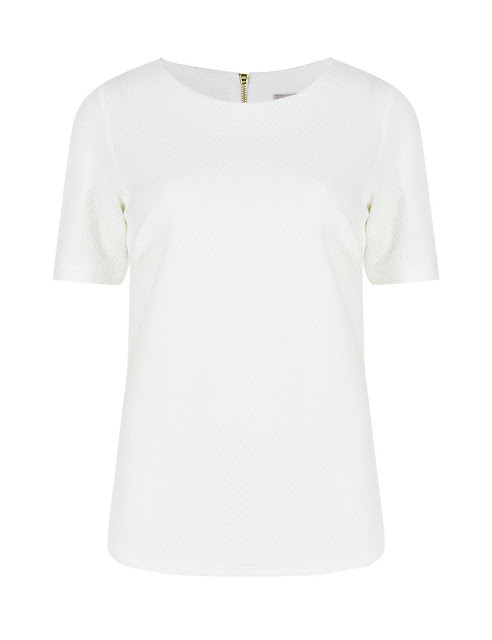 Then I opted for this M&S textured boxy top (£19). 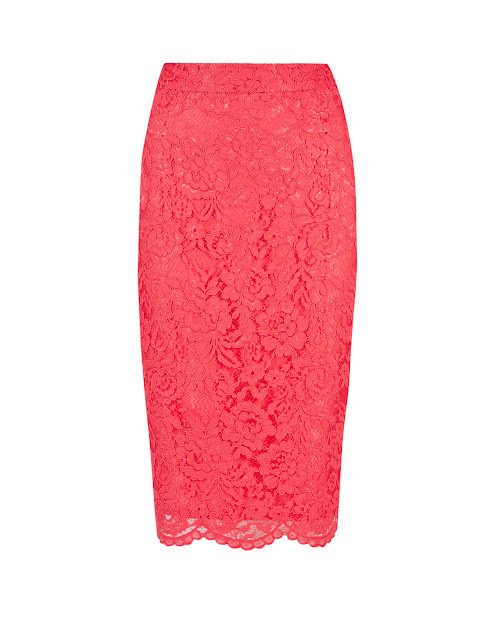 With the skirt being so bright I was happy for that to take centre stage, with the top very much playing second fiddle. But then I opted for a piece of statement jewellery, just to balance the outfit out. 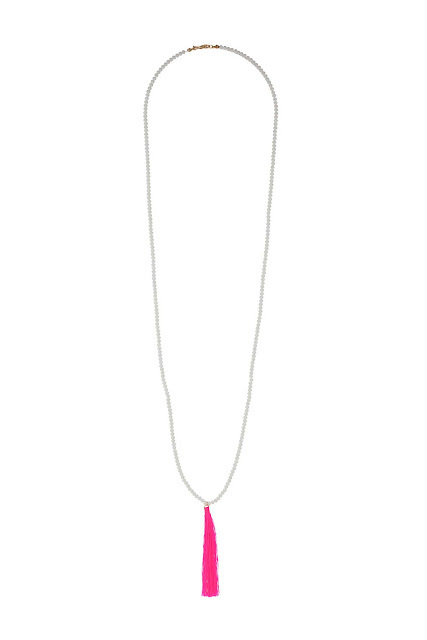 I chose this Limited Edition chain link necklace (£18) because I liked the blue of the necklace with the coral skirt. And finally, I opted for these Autograph shoes (£55). Again there has to be sufficient availability and I like to wear heels for these events - especially as the models went on to the stage first - all 5ft 10" of them on average - and then I had to come out second. What a disappointment to the audience - the dumpy, ugly one! Finding the right skirt for summer can be tricky but when I spied this one across the shop floor, it was love at first sight. Thick, white, cotton with a good length, pockets and a paper bag waist, I knew that this was the one for me. Admittedly not all tops work with this skirt - they need to be the right length but that can be achieved either by tucking in, or tucking under, or just by getting one that sits on the waistband. I don't think that I would look out of place at a jubilee party here - bring on the red, white and blue! The other good thing about this skirt is that I can take big, proper, strides in it without it appearing too voluminous. I'm not good with skirts that restrict my movement. I take too big a stride, they pull me back, I fall over, the the skirt and I fall out and off to the charity shop it goes. In this outfit I wore a cropped French Connection tencel shirt, M&S platform sandals and a pink Mulberry bag. Providing that I don't wreck it by chucking things down it - although it seems pretty hardy so it could probably take chemicals and a good scrub - it should serve me well over the next few months with breton t-shirts, vest tops, brighter bits and bobs or black for a monochrome look. I think that the thing now is just to wear it - lots. When I was invited by Boden to write a post on a topic of my choosing, there was one topic that immediately sprang to mind - summer dresses. It doesn't matter what else I may have in my wardrobe, my search for the perfect summer dress is always on. And then, when a sunny day arrives, knowing that my perfect dress is sitting in the wardrobe makes my day complete, even before I've opened my eyes. To me spots always signify the arrival of the spring and summer and it is for that reason that I chose to include the Iris shirt dress (£79) which comes in four colour ways. This classic combination of navy and white would work well for an office or work environment, without being too formal. Although the dress would look great teamed with a navy or cream bag, I felt that with its dark background it could take an injection of colour and this yellow Kate Spade bag ticked that box nicely. For me, whatever the occasion, it's nice to have an element of something unexpected in your outfit, which is why I also opted for the spotty shoes, rather than a more traditional plain shoe. Spots also lend themselves really well to a pattern clash, so I worked in some leopard print shoes and a leopard print belt, above and below. In fact spots pretty much work with anything - so just have a play and see where they take you. Style notes, I'm wearing the size 8 in this dress but there was enough room in it for me to have sized down to a size 6. Although I'm only 5ft 6" tall, I ordered the long length as I was interested to see how "long" the long really was. For a smarter dress like this, I liked the longer length - and to me it's a real bonus that Boden does a longer length. Another favourite of mine for the spring and summer are stripes, hence my choice of the Blackberry dress (£49). This dress comes in seven colour ways, not all of which are striped. This dress is a more casual option that the Iris shirt dress although it can be styled up. The soft jersey fabric makes it a really easy dress to wear and perfect for a summer holiday or day trip out with children in tow and all that that entails! 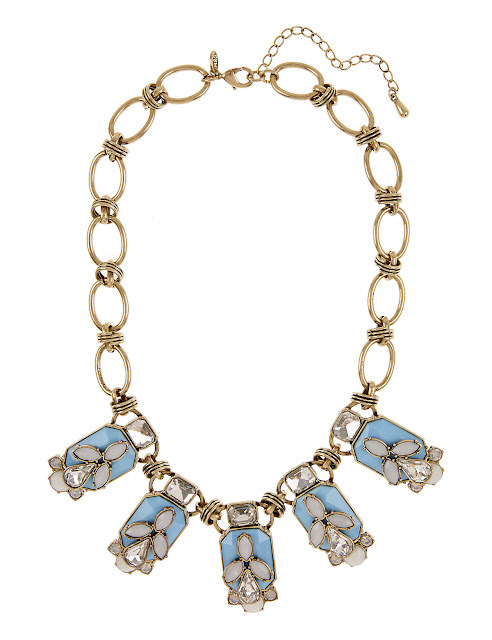 I'm wearing this dress with an old favourite statement H&M necklace which people ask me about whenever I wear it. In the top picture I've opted for a summer basket and above and below I've swapped the basket for a tasselled flamingo pouch, which instantly makes the outfit more pub/dinner appropriate, despite the flat Topshop shoes. Style Notes: This dress is also a size 8 and comes up true to size. I think that it might be possible to size down to a size 6 but then I might be conscious of the elastic on my waist and I don't like that feeling, even if it's not tight. As to the length? Again this is the longer length but because I would wear this dress casually and probably with flats, I would be tempted to try the standard length, just for comparison purposes. Honesty policy! Although I have received payment for this post, Boden have not had any control over its content. All of the statements and opinions given are my own and all are completely genuine. The trust that readers place in my recommendations is very important to me and I wouldn't do anything to jeopardise that. This post wasn't intended to go down this route but now that I've looked at the trousers, I think I'll talk through the rest of the pieces that I'm wearing in this outfit. There are a few pieces that can truly be worn pretty much any day of the year but a denim shirt really is one of those pieces. It too is made form tencel and this one is from New Look (£17.99). Next also has a good selection. I'm still loving tassels in a big way and the bead and tassel necklace that I'm wearing is from Topshop (£12.50). Predictably I was attracted by the pink! I'm also wearing a longer one which was gifted to me last year by Marianna Boutique and it's by ChloBo. 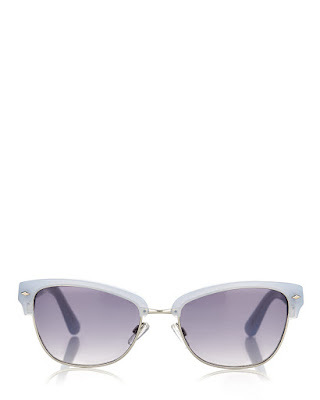 Finally the sunglasses are by Jigsaw (£59). These glasses are quite a statement for me and not something that I would have worn years ago. But I guess that's the one good thing that comes with age - you gain a little more confidence about some things and worry a little less about others. And in glitter, such as these New Look lace up espadrilles (£9.99) - which also come in stripes. 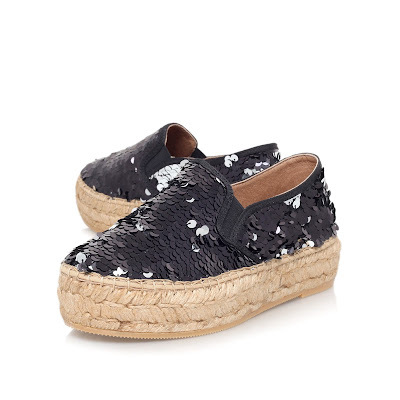 New Look has a great range of espadrilles - despite their photos not being up to much when it comes to writing a blog - which is irritating but not irritating enough to put me off going to take a closer look at these sparkly ones next week.